The distinguishing vocalization "chick-a-dee-dee" of the Black-capped Chickadee is one of the most complex vocalizations in the animal kingdom. 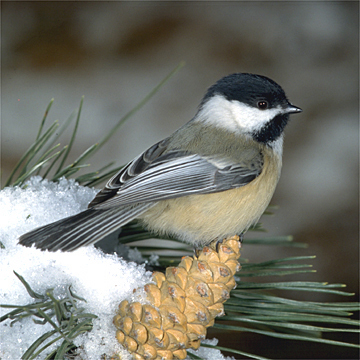 Depending on slight variations in the phrases, the call can convey separate, unique messages: in addition to acting as a contact call or as an alarm call, chickadees also use their call to relay information about an individual's identity or to indicate that they recognize a particular flock. Fairly tame and common backyard bird through much of North America. Breast, belly, and vent are whitish. Flanks, breast, and belly are buff. White from their cheeks to the side of their nape. A sooty black bib extends from the chin and throat to the lower sides of the cheeks and upper breast. The bill, legs, and feet are dark, predominantly black. This information was gathered from the Cornell lab of Ornithology.